Time for another round of Yvo’s Shorties! This time around a YA edition… The first book is the sequel of a series I was supposed to continue ages ago: Prodigy by Marie Lu. It was just as entertaining as the first book! The other title is one I wasn’t sure I wanted to pick up, but after seeing Ashley @ Socially Awkward Bookworm mention it as her biggest surprise of 2018 so far I decided to give it a go. 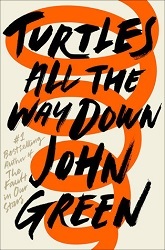 Turtles All The Way Down by John Green… And maybe it was just that I wasn’t in the mood for it, but I wasn’t able to enjoy it as much as I hoped I would. I read Legend back in 2015, and even though I quite enjoyed the first book and vowed to read the sequels soon, somehow that never happened. One of my goals this year is to finish those poor neglected started series, and when I came across my copy of Prodigy I decided to pick it up on a whim. 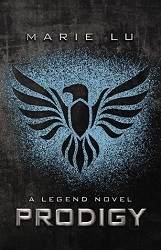 It was surprisingly easy to pick up where the first book had left off without rereading Legend, and there is no doubt this sequel is a very entertaining read. I managed to finish it in no time at all! The dystopian world is quite interesting; not that original maybe but I liked the dynamics. Could I have done without the multiple love triangle trope? Hell yes. Did that made me lower the rating slightly? Positive. But otherwise I found Prodigy to be a fast-pace and engaging YA dystopian read with a lot of promise for book number three. A healthy dose of action and twists are in place, and while not the most original plot, it will manage to grab your attention anyway. I’m looking forward to find out what the final book will bring. There is always such a hype around John Green‘s books and I’m sure you are already aware of just how well hyped books and me are getting along. I had made a promise to myself to leave his books be for now after a few ‘it’s not you, it’s probably me‘ experiences… But my curiosity was piqued by Ashley @ Socially Awkward Bookworm when she mentioned Turtles All The Way Down was her biggest surprise of 2018 so far. Do I regret reading the story? No, because I would have always wondered otherwise. Is it a bad read? Not exactly. But it was definitely one of those cases where the story just didn’t work for me. Which is actually kind of strange, because I’m always intrigued by a story with a mental illness theme and I do love my quirky and unique characters. But there was just something about Aza that just didn’t do it for me. There is nothing wrong with the character development and I think John Green did a great job giving us a peek inside her head and how it would be like being her. It just didn’t work for me in particular. The same goes for Daisy, although I do love the fact she writes fan fiction. The plot is a bit farfetched, but it adds a certain air of mystery to the story, transforming it from just another contemporary romance with mental illness angle to something a little more complicated. I do have to admit the pace was pretty slow though, and I could have done without annoying YA tropes like instalove. And was the story exactly credible as a whole? I’m still on the fence about that. 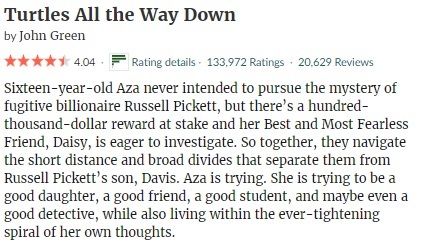 But I guess fans of the genre who like their characters unique, flawed and intriguing will probably like Aza and her story as well. Hello, new hyped title on my unpopular opinion review list… Do make yourself comfortable. 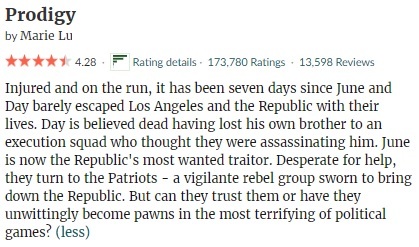 This entry was posted in 2018, 3 Star Rating, 4 Star Rating, Book Reviews, Yvo's Shorties and tagged 4 star rating, book review, contemporary, dystopia, fiction, john green, legend, love triangle, marie lu, mental health/illness, prodigy, published in 2013, published in 2017, realistic fiction, romance, science fiction, series, turtles all the way down, ya, Yvo's Shorties by Yvo. Bookmark the permalink. Hmm…I still can’t decide if I want to read Turtles or not. Yeah it was a tough call for me as well… I’m definitely staying away from his books for a while now. I’ve heard so many mixed reviews about Turtles that I haven’t picked it up. Sorry to hear it wasn’t that great for you.